There are two types of Avamar retention settings. Basic retention settings specify a fixed expiration date. Advanced retention settings specify the number of daily, weekly, monthly, and yearly backups to keep. 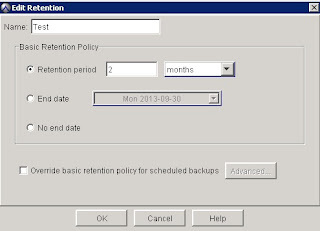 Retention Period: Allows you to specify how long will the backup from the backup taken. No end data: Backups never expire. Allows you to define how long to keep backups based on how they are tagged. Backup jobs can be tagged as daily (D), weekly (W), monthly (M) and yearly (Y). Every backup job is a daily job and is marked with a "D". If a backup was made on a Sunday, it is tagged with a "W" to signify it is a weekly. The very first backup job of the month is marked as an "M" which stands for monthly. The very first backup job of the year is marked with a "Y" for yearly. Tags can be combined for backup jobs to create layers of retention. The first backup job of any system is tagged as "DWMY". Jobs made on a Sunday are tagged "DW", while the first backup of the month is marked "DM" if it is not on a Sunday, which is then tagged with a "DWM". For purposes of assigning advanced retention types, each day begins at 00:00:01 GMT, each week begins on Sunday, each month begins on the first calendar day of that month and each year begins on January 1. 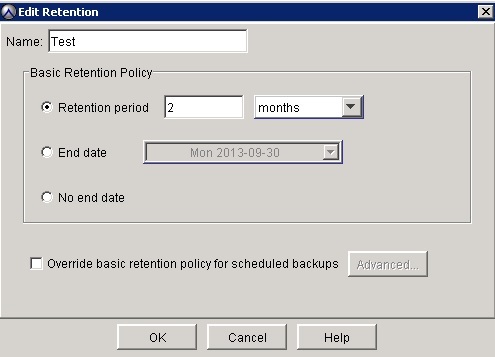 Notes:You cannot apply advanced retention settings to on-demand backups. On-demand backups can occur at any time, and are therefore inherently asynchronous—the system cannot tag them as daily, weekly, monthly, or yearly.